CORNING, Mo. — As the cleanup along the Missouri River continues following significant flooding last month, several communities are finally seeing what the floodwaters left behind. Flooding ravaged farmers along the Missouri Bottoms, including 71-year-old Bruce Biermann’s farm in Corning, Missouri. The fourth-generation farmer surveyed his farm on Wednesday. He said two grain bins containing corn and soybeans were destroyed. The strong current washed the bins into his front yard and even into neighboring fields. “Where they are now deteriorating, rotting, swelling up and sprouting,” Biermann said. He stored the grain because it was a down year for market value on the crops. He was hoping to sell when prices increased. “This year it wasn’t as attractive as we needed it or what we would have liked for it to be, but we needed to start moving grain,” he said. 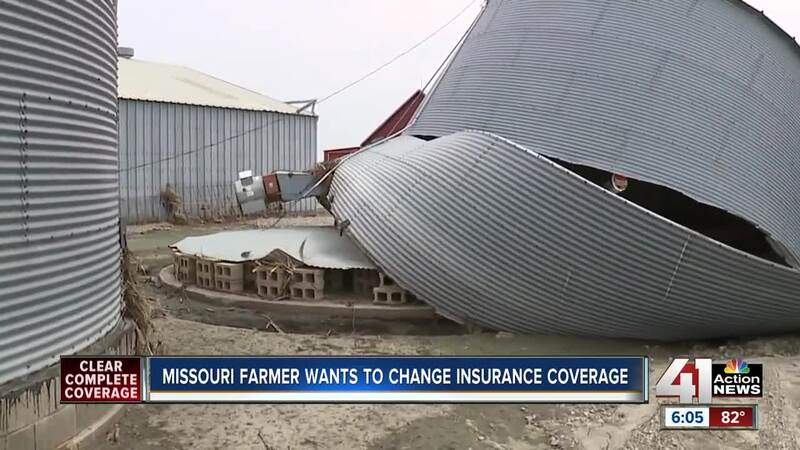 He learned a hard lesson: all of his grain is now ruined and will not be covered by insurance because stored crops aren’t covered under federal law. “All this would have to come out of our pocket, along with the loss of income from the grain that has no market value left whatsoever now,” Biermann said. The financial damage totals around $120,000 in lost grain. “That money was supposed to go ahead and help me finance and do my farming for 2019,” he said. Biermann won’t be in the fields this year. Over his 71 years, he said he's been through a lot of floods, but this one might be his last. With the possibility of more flooding on the way, Biermann hopes lawmakers make changes soon to help farmers in these situations.